Poaching fish is one of the lightest and healthiest ways to prepare seafood. It's excellent for large and oily fish, such as salmon, pike, striped bass, and large trout. It's a cooking method that calls for no additional fat to cook. And can be served hot or cold. Steaks, fillets, or whole fish of at least 1/2 inch thick is submerged in a flavored liquid and cooked. The liquid can be either a court bouillon, water, milk, juices, or a chicken, fish, or vegetable broth. Most of which, often has wine and/or vinegar in it. Herbs, spices, and vegetables are commonly added to it as well. When poaching fish, you should never allow the liquid to come to a boil. Place the fish in cold or room temperature liquid, and then bring it to a gentle simmer. The simmering will allow the herbs, vegetables, and wine to infuse the fish with their flavors. The best method of poaching fish is using a fish poacher with a rack that can be raised and lowered. 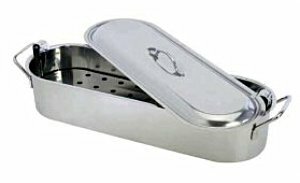 This helps to keep fish from breaking apart when trying to remove it after it has been cooked. Roasting pans or deep skillets can be used as well. Or anything you already have in your kitchen that you can make use of. A rack with handles can be placed in the pan under the fish so that it can be removed easily without falling apart when it's done cooking. A couple of long spatulas will work. Or wrapping up the fish in cheesecloth before cooking it will make it a little easier to retrieve. Another method of poaching fish is called en papillote. En papillote is a french term used for cooking in a paper case, such as parchment paper. This is a method of steaming fish or poaching fish and vegetables that is securely wrapped in parchment paper. It can be cooked in simmering water or baked. The paper keeps in the moisture and steam created from the fish's own juices as it cooks. Oven poaching in heavy duty aluminum foil is basically the same method as en papillote. It's a personal preference on which is better for you. Foil is a little bit easier to work with though. And it's more common to have aluminum foil in the kitchen already at hand. Steeping is another variation of poaching fish. This is done by adding fish to a boiling liquid that is twice as high as the thickest part of the fish. Once the fish has been added, cover the pan and remove it from the heat. Allow it to set for about 8-10 minutes as it will continue cooking as the temperature drops down to about 165°-170°. This method works best with fish steaks and fish fillets that are less than 1½ inches thick, or for reheating already cooked fish. You can use the remaining poaching liquid as a base for a sauce. Boil it down to reduce it for the sauce, or use it for a broth. You can freeze it if you want to save and reuse it for your next batch. It becomes richer in taste with each time that it's used. It's a good idea to add more onions and a little bit of wine to freshen up the flavors and taste. The poaching liquid is extremely valuable for chowders, soups or linguine.